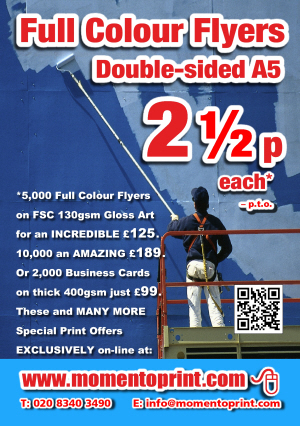 A5 Flyers for LESS than 2p each !!! That’s NOT a misprint, we DO mean LESS THAN 2p each for Full Colour, Double-Sided, A5 Flyers. NOT 2-and-a-half pence, NOT even just 2 pence . . . BUT actually LESS THAN 2p each . . . when you order 10,000 Double-sided, 130gsm Gloss Art, A5 Flyers directly from our On-Line Cheap A5 Flyers and Leaflets page >Click Here<. Select these, or any of our other printing products from the >Order Now< links on the front page special offer panels, or from our Products List page for what we believe are some of the cheapest printing prices on-line. Remember, these prices are EXCLUSIVE to NEW orders placed directly on-line from our momentoprint pages . ***And Yes !!! any un-expired Subscriber Discount Codes may still apply and give even greater savings to these incredible prices!!! And, of course, don’t forget to browse many more of our Special Offers at: momentoprint for more amazing on-line Printing Discounts. Remember, these prices are JUST A FEW of our pricing options available from our momentoprint pages .